CORAL SEA - The Navy’s forward-deployed aircraft carrier, USS Ronald Reagan (CVN 76) began participating in exercise Talisman Saber 2017 (TS 17) off the coast of Australia, July 8. TS 17 is a joint exercise sponsored by the U.S. Pacific Command and Australian Defence Force Headquarters Joint Operations Command designed to enhance U.S.-Australian military interoperability through a variety of maritime, land and air operations scenarios. 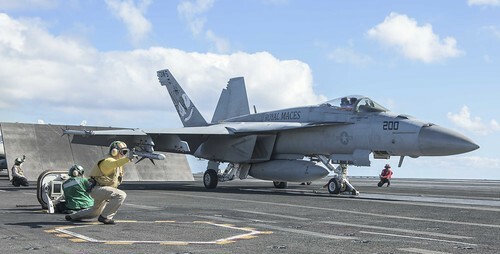 TS 17, which began June 23, will include more than 33,000 U.S. and Australian personnel and feature 21 ships, to including the Ronald Reagan Carrier Strike Group, the Bonhomme Richard Expeditionary Strike Group, and more than 200 joint aircraft. This is the seventh iteration of the exercise and will focus on training a combined task force of U.S. and Australian forces in a mid-intensity warfighting scenario, incorporating interagency participation, along with a command post exercise involving a transition between a three and four-star headquarters. U.S. Pacific Command units and Australian forces will conduct sea, land, air, cyber training exercises throughout multiple training areas in and around Australia. The exercise will be conducted from multiple locations in the U.S. to include: Joint Base Pearl Harbor-Hickam, Naval Base San Diego, Joint Base Lewis McChord, Naval Station Norfolk Suffolk Joint DoD Complex, Camp Atterbury, Indiana, and on the island of Guam; and multiple locations in Australia to include: Darwin, Rockhampton, Amberley, Canbena, Enoggera, Fog Bay, the maritime areas of the Coral Sea; and Australian ranges to include the Bradshaw, Shoalwater and Townsville Field Training Areas. The exercise also includes participation from a number of international organizations, including the World Food Programme, the United Nations Office for the Coordination of Humanitarian Assistance, and the International Committee of the Red Cross. Australian government entities include the Department of Foreign Affairs and Trade, the Australian Agency for International Development, the Australian Civilian Corps, the Australian Federal Police, and the Asia Pacific Civil-Military Centre of Excellence. U.S. participating agencies include the U.S. Departments of State, Justice and Agriculture, Federal Bureau of investigation, U.S. Agency for International Development and the Red Cross. The U.S. and Australia train and work together in a variety of exercises and missions throughout the year, including working together on humanitarian and civic assistance missions in the Indo-Asia-Pacific region. Learn more about the exercise on the Talisman Saber website, follow coverage on the exercise's DVIDS feature page, and connect on Facebook and Twitter. Ronald Reagan, the flagship of Carrier Strike Group 5, provides a combat-ready force that protects and defends the collective maritime interests of its allies and partners in the Indo-Asia-Pacific region.